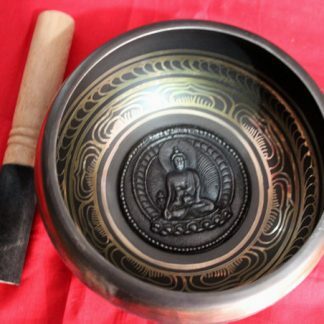 Descriptions Of Mantra Singing Bowl. This is a seven metal hand carved singing bowl from Nepal. 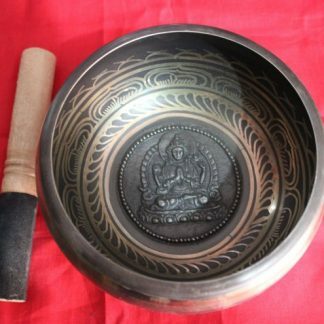 Tibetan Om Mantra are carved through out the bowl. 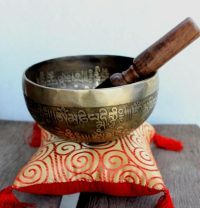 Mantra Singing bowl is used worldwide for meditation, music, relaxation, and personal well-being. 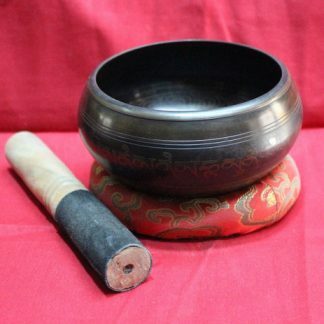 Singing bowls are originally made in Nepal. 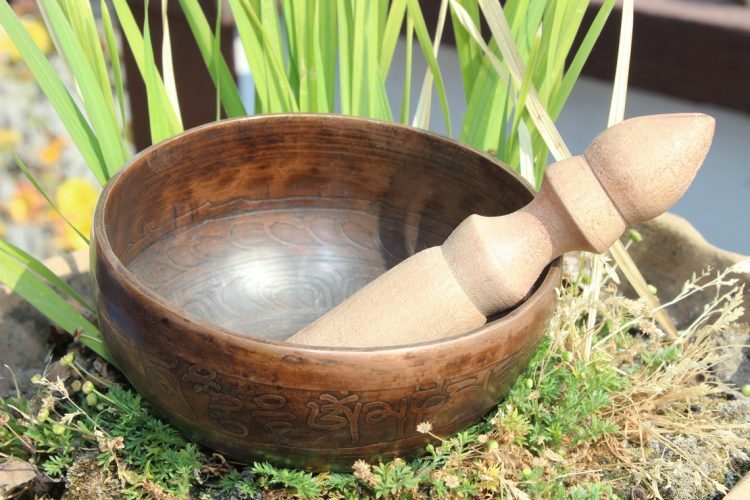 Tibetan bowls are ritual object used in the Himalayan region very popular since ancient times. 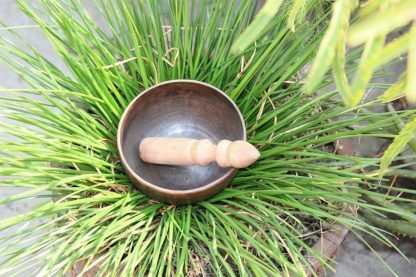 Singing bowls are renowned for their healing and relaxing sound quality. They are audio phonic instruments that broadly fit into the family of bells and gongs. 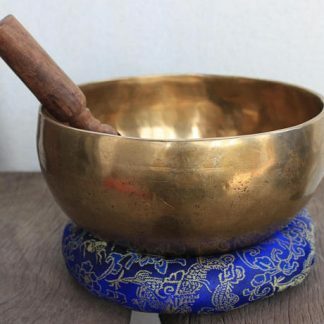 Every singing bowl is unique, and their sound quality depends upon a variety of factors including the combinations of metal, thickness of the bowl and the shape and size of the bowl. The singing bowls are now increasingly becoming popular in Western civilization since the mid-twentieth century. The reason of its popularity is considered because many of the spiritual inquisitive people these days are exploring Eastern philosophy and religion. Even though lots of eternal masterpieces pertaining to Asian Buddhism like buddha statues, prayer wheel, Pagoda, Stupa, Thangka can be found all over world. They are originated from Nepal. And also the singing bowls are no exceptions. Nepal is the origin of all Tibetan handmade bowls. Nepal’s town of craftsmen, Patan is with out doubt the best location to get a high quality and variety of Tibetan singing bowls. Patan’s legendary craftsmen are simply unbeatable in terms of their highly developed skill and dedication that they acquired from their ancestor for generation to generation. The generation dates back to the Lichhavi dynasty fifteen centuries ago. 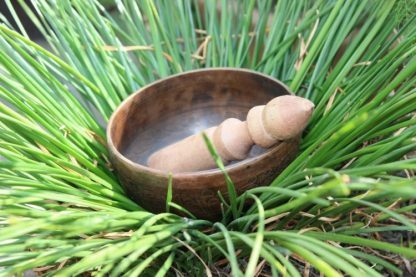 learn more about singing bowls here. This singing bowl is a seven metal hand carved and hand hammered fine singing bowl from Nepal. The note of this bowl is “E”.